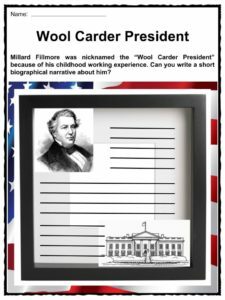 Millard Fillmore was the 13th President of the United States (1850-1853). The disintegrating of the Whig Party happened during his term, after the dispute over the Compromise of 1850. 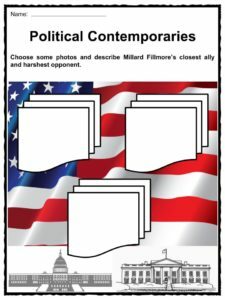 For more information on Millard Fillmore read the fact file below or download our comprehensive worksheet pack to utilise within the classroom or home environment. Millard Fillmore was born on January 7,1800 in Cayuga County, New York and was the son of Nathaniel Fillmore and Phoebe Millard. At a young age, Millard helped his father on the farm and became an apprentice to a cloth maker. Unlike most of the American Presidents, Millard was exposed to life’s poverty. 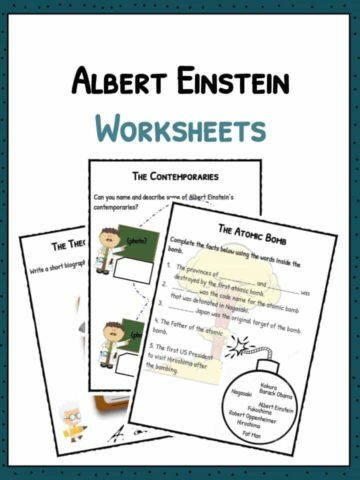 Prior to 1819, he was not able to be educated in a formal school, thus his reading and writing abilities were self taught. He attended the New Hope Academy where he met his future wife, and in the same year, Millard worked as a clerk in Montville, New York which gave him the chance to study law. On February 10, 1826, he married Abigail Powers, with whom he had two children. In 1858, Caroline Carmichael McIntosh became his second wife. In 1823, Millard was admitted to the bar and shortly after, practiced law in East Aurora. He was elected to the New York State Assembly in 1828 after he joined the Anti-Masonic Party. As an assemblyman, he was successful in reducing prison sentences for debtors. 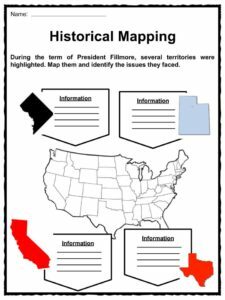 From 1833 to 1843, Fillmore was elected to the U.S House of Representatives as a member of the Whig Party. 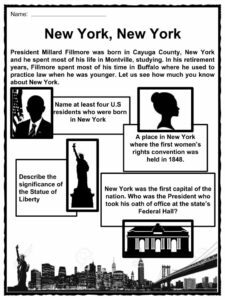 In 1847, he became New York’s comptroller after he lost the gubernatorial seat for the same state. Two years later, he won the vice presidency along with President Zachary Taylor. President Millard Fillmore took his oath of office as the 13th President of the United States on July 10, 1850 at the House of Chambers in the U.S Capitol after the death of Taylor. He appointed new members of the cabinet who were in favor of the 1850 Compromise draughted by Henry Clay. 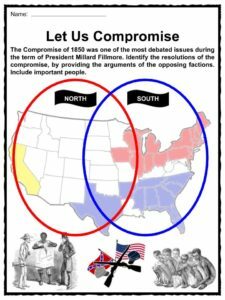 The Compromise, which came from the ideas of Senator Stephen Douglas, became the most debated issue in both houses of Congress. The Compromise was composed of the following resolutions: (1) allowing California to join the Union as a free state, (2) settling the Texas boundary, (3) arranging New Mexico’s territorial status, (4) reinforcing the Fugitive Slave Act, and (5) abolishing the slave trade in the District of Columbia. On September 9, 1850, the free state of California became the 31st member of the Union. Nine days later the Fugitive Slave Act of 1850, also known as the “Bloodhound Law” by the anti-slavery politicians, was passed. Brigham Young, upon his appointment by President Fillmore, became the leader of the Latter Day Saints and first governor of the newly colonized Utah territory. President Fillmore decided to be neutral regarding the Hungarian Revolution. In addition, he tried to prevent Narciso Lopez’s planned invasion and liberation of Cuba. Lopez was executed by the Spaniards in May 1850, while Fillmore was blamed by the supporters of the invasion. 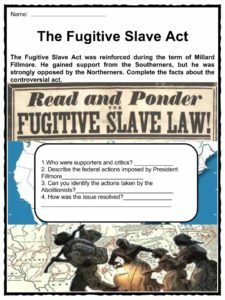 The Fugitive Slave Act was enforced during Fillmore’s term, but the abolitionists from the north continued to rescue captured slaves. It also gave way to the separation of the Whig Party into both antislavery and proslavery factions. He lost the party nomination for re-election, especially losing support from the abolitionists. In relation to Fillmore’s foreign policy, he sent Commodore Perry to Japan to improve trade relations, but nothing materialized from the visit. His administration also worked for the protection of Hawaii against European invasion. Upon retirement, he continued to serve as the Chancellor of the University of Buffalo in New York. He was offered an honorary Doctorate of Civil Law by Oxford University, which he later turned down. In 1853, his wife Abigail died from pneumonia weeks after attending the inauguration of President Franklin Pierce. His daughter Mary, died of cholera a year later. 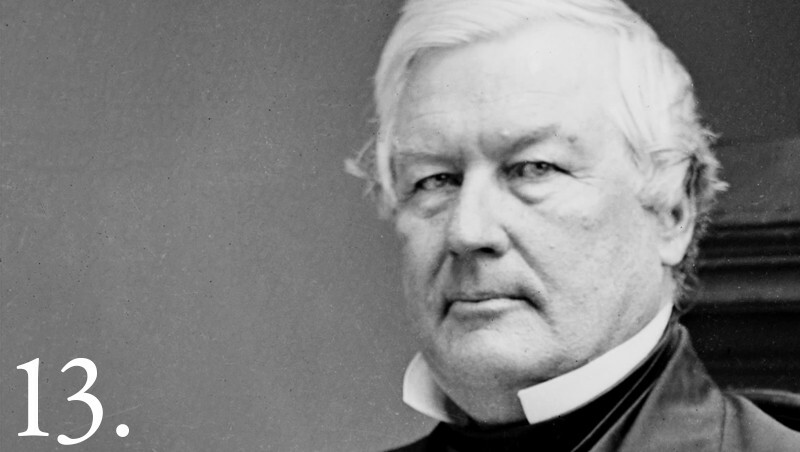 In 1856, after the disintegration of the Whig Party, Fillmore joined the Know-Nothing Movement against the Republican Party. The Know-Nothing Movement was both anti-immigrant and anti-Catholic. He ran for president along with Andrew Jackson Donelson as Vice President, but both of them finished third. Fillmore decided to retire from politics after the defeat. Fillmore became the first President of the Buffalo Historical Society. He was a supporter of Vice President Andrew Johnson until President Abraham Lincoln’s assassination. On March 8, 1874, Millard Fillmore died from complications of a stroke. His body was interred at the Forest Lawn Cemetery in Buffalo, New York. As part of his legacy, Fillmore, Utah was named after him. 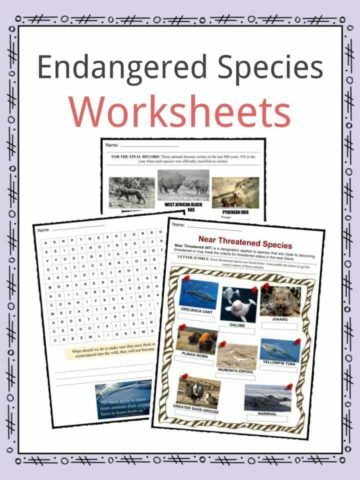 This bundle contains 11 ready-to-use Millard Fillmore Worksheets that are perfect for students who want to learn more about Millard Fillmore who was the 13th President of the United States (1850-1853). The disintegrating of the Whig Party happened during his term, after the dispute over the Compromise of 1850.